Kevin Curry's avocado keto taco bowl. The ketogenic, or keto, diet is described as “Atkins on steroids” for its focus on foods high in fat and low in carbohydrates. Instead of looking at the diet as having to give up foods, look at it as a way to get creative in the kitchen with foods that are keto-compliant. 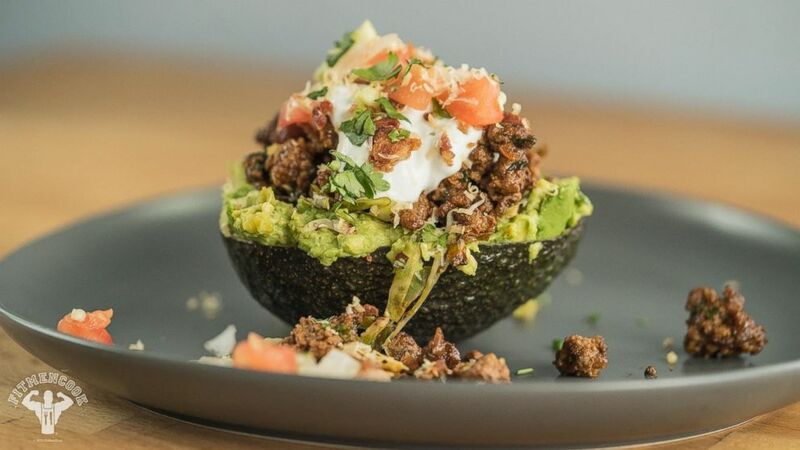 "Fit Men Cook" creator Kevin Curry, for example, uses an avocado as a taco bowl and swaps the bun in a Greek turkey burger for a portobello mushroom. If you think dessert is out of the question on keto, try Curry's decadent chocolate mousse. After learning to cook healthy dishes for himself, Curry launched Fit Men Cook, a website that offers recipes and meal plans. The Dallas, Texas-based chef is also the author of his first cookbook, “Fit Men Cook,” has his own app and has more than 1.5 million followers on Instagram. Try these three keto recipes from Curry. Get all your questions about the keto diet answered here. 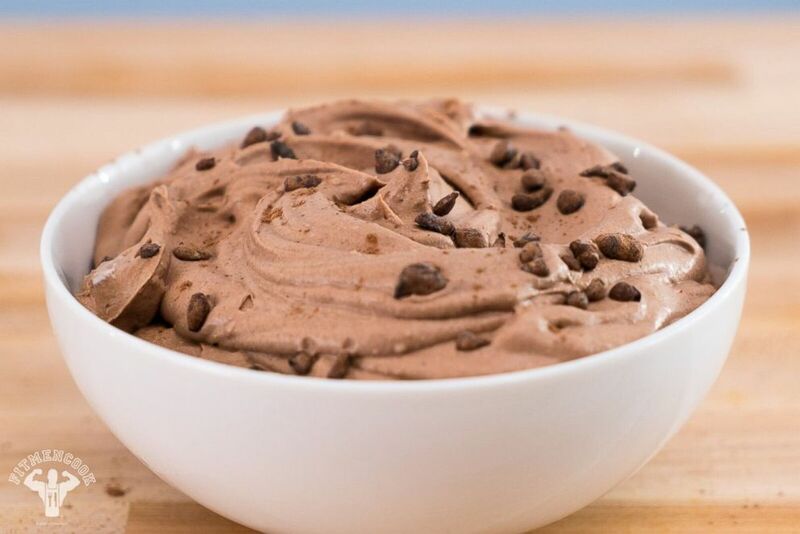 Kevin Curry's decadent and easy keto chocolate mousse. Refrigerate the cans of coconut cream for at least four hours. Scoop out just the coconut cream –- no liquid -– into a chilled bowl, preferably a metal bowl. Add the remaining ingredients and blend with a hand mixer for at least 15 minutes or until peaks form. For the final five minutes of mixing, I like to change the mixing attachment to a whisk to make the mousse a little more voluminous. Recipe reprinted with permission from Kevin Curry/Fit Men Cook. Set a nonstick skillet on medium heat, add bacon. Cook until crispy, about five minutes. Remove the slices from the skillet. Add shredded Brussels sprouts to the skillet and cook for three to five minutes, until the outside edges are seared. While it cooks, add lime juice and a pinch of sea salt and pepper. Remove from the skillet. Add olive oil, garlic and red onion. Caramelize the onions for three minutes before adding the ground meat. Chop up the meat in the skillet for about two minutes, then add the seasonings. Continue chopping and cooking until the meat is no longer pink, about five minutes. Season to taste with sea salt and pepper, cilantro and lime or lemon juice. Slice the avocados in half and remove the pits. Using a fork, mash up the flesh of the avocado, then form a large hole/dip inside the avocado for the filling. Add sauteed Brussels sprouts and meat, then top with garnish. 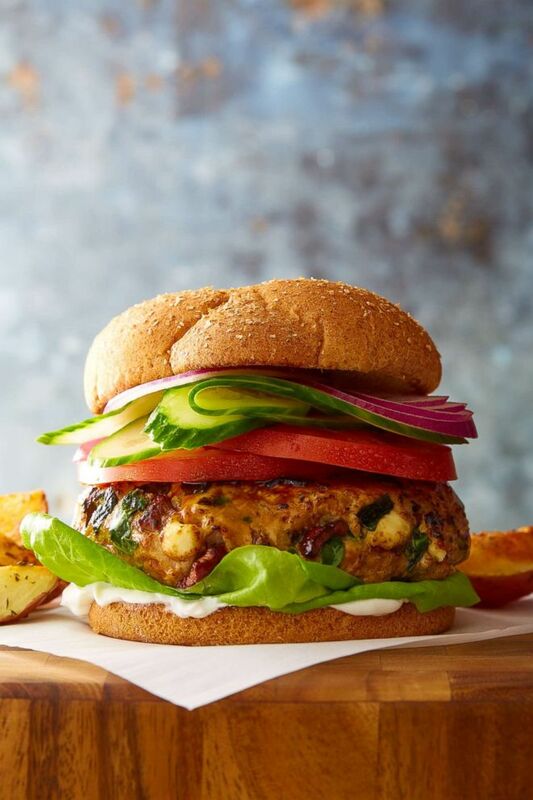 Kevin Curry's Greek turkey burger. Add all the ingredients to a large bowl and mix together thoroughly. Scoop out a large fistful of meat, roll it into a ball, then flatten it to forma patty around 1 1/2 inches thick. Repeat with the remaining meat to make five large patties of equal size. Once the patties are formed, use your thumb to make a shallow indentation in the middle of each patty to prevent them from forming a dome as they cook. Set a large oven-safe nonstick skillet over medium-high heat and spray lightly with olive oil. When the skillet is hot, add the patties. Cook on one side for three to four minutes, until the edges are brown and seared, then flip the patties over. Cook for an additional minute, then place the entire skillet in the oven to cook until the internal temperature is 165 degree Fahrenheit, nine to 11 minutes. You can also bake them on a baking sheet lined with parchment paper or aluminum foil for eight to 10 minutes. Pair the burger with cauliflower rice (recipe below) and/or a grilled portobello mushroom, then add about half of a mashed avocado on top. Place the cauliflower in a food processor or high-powered blender. Pulse it until you have a rice like texture. Be careful not to pulverize it. Add the cauliflower rice to a cheesecloth or thin but sturdy towel and wrap it up tightly. Squeeze to release as much water as possible. Depending on how much you lift at the gym or the amount of stress you are under at work, you may need to repeat this step a few times in order to get as much water out as possible. Unwrap the cauliflower and set it aside in a bowl. To a large nonstick skillet over medium heat, add the onion and bell pepper and cook until tender, about 6 minutes. Add the garlic and cook about 2 minutes more to allow the oil to absorb all the flavors. Add the cauliflower and any extra flavors to the skillet. Mix everything together, then cover and cook until the rice is firm yet tender, about 6 minutes. Season to taste with salt and black pepper, then garnish and make it your own using the tips below. Reprinted from Fit Men Cook: 100+ Meal Prep Recipes for Men and Women –Always #HealthyAF, Never Boring. Copyright © 2018 by Fit Men Cook, LLC. Photographs copyright © 2018 by Kevin Marple. Published by TOUCHSTONE, an imprint of Simon & Schuster, Inc.